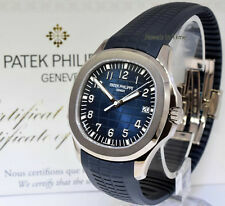 PATEK PHILIPPE MODEL # 5164A OR 5164A-001 or 5164A. This watch is an Exquisite Complicated Patek, and features a Black Dial, Exhibition Case Back, and Tropical Strap. Band:Tropical Strap. Material:Stainless Steel. This Patek Philippe Aquanaut is a comfortable-to-wear men's wrist watch with mechanical: automatic movement that offers its owner precise timekeeping. The case is made of stainless steel with sapphire crystal glass face. The dial is colored in black. The rubber strap of this model is finished in black. The watch has water resistance up to 390 meters. Some of the features implemented in this analog timepiece include water resistant.